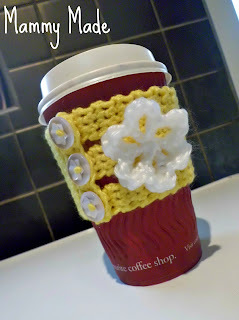 I decided to try my hand at making a coffee cup cozy. I have had eczema on my hands since I was younger and the skin on my hands has gotten really thin after years of using steroid creams on them. I always find that cups of coffee burn my hands so I can't hold them when they are first made. It's hard enough carrying a 3 year old, 2 year old in her pushchair and all the things that two young children need, never mind juggling a cup of coffee that's burning your hands aswell. Not fun! You should end up with a long rectangle that fits around your cup and three buttonholes at the very start of the rectangle. You should now have three straps on your cozy for the three buttonholes you worked earlier. 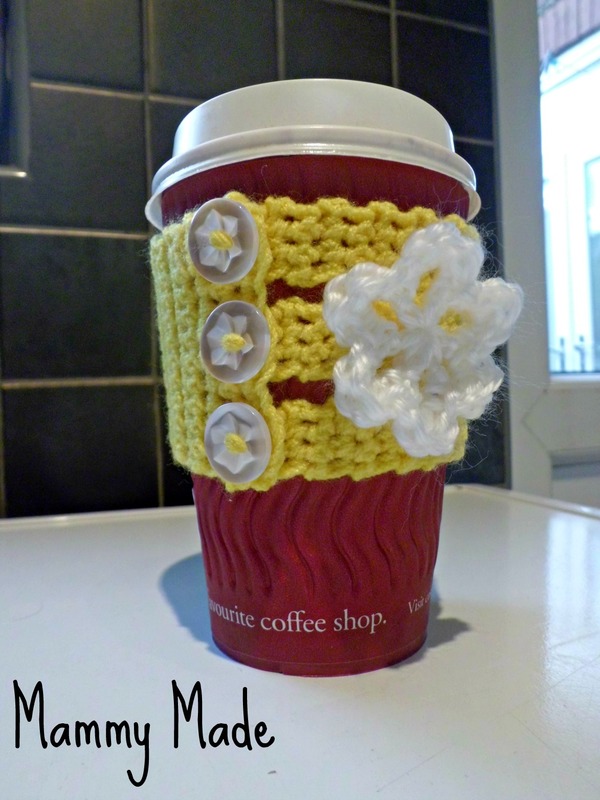 Check the fit around your cup and make sure the cozy fits snugly. Shorten the straps a little if necessary. I found this size was good for a medium sized cup. Weave in all ends and add a button on the end of each strap. Flower: Using contrasting yarn, I made a simple flower as shown in this tutorial, and stitched it on to the cozy. Oh so pretty, I wish I could crochet! Very impressive making up your own crochet patterns! WOW !!!!!!! Very nice pattern Thank you. can I have the permission to see what i make from this pattern .